This lacewing larva turned up in a bowl of freshly picked cherries. It was already mortally wounded with a crushed abdomen, but the front end was intact so I euthanized the beast with ethyl acetate fumes and photographed it on the cherry stem where it was already sitting. The image above is almost the whole frame, at about 4X on APS-C. Here's a closer crop of the same image. At this scale the thing on the end of its jaws looks like maybe some sort of prey, but on even closer examination it looks like some bits of plant fiber, clear with some green bits in or on them. The above images are made with Zerene Stacker DMap with extensive retouching from individual frames and PMax output. Of course I wanted to see the beast in stereo also, but it turned out that the lighting was too hard (too directional) to look good without the retouching, which is not practical in stereo. Larval Neutoptera and some pradaceous larval Coleoptera that digest their prey extra-orally have a food canal in each of the mandibles. 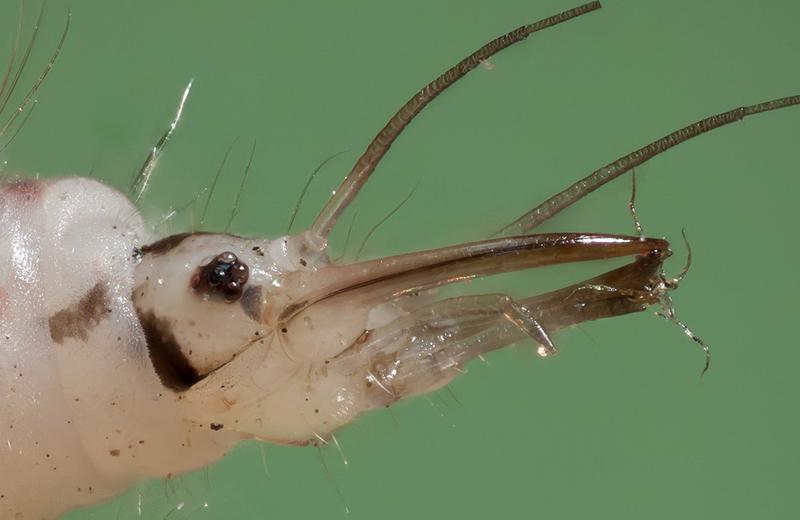 These function in a similar way to those of biting and chewing insects, but they are sickle-shaped. 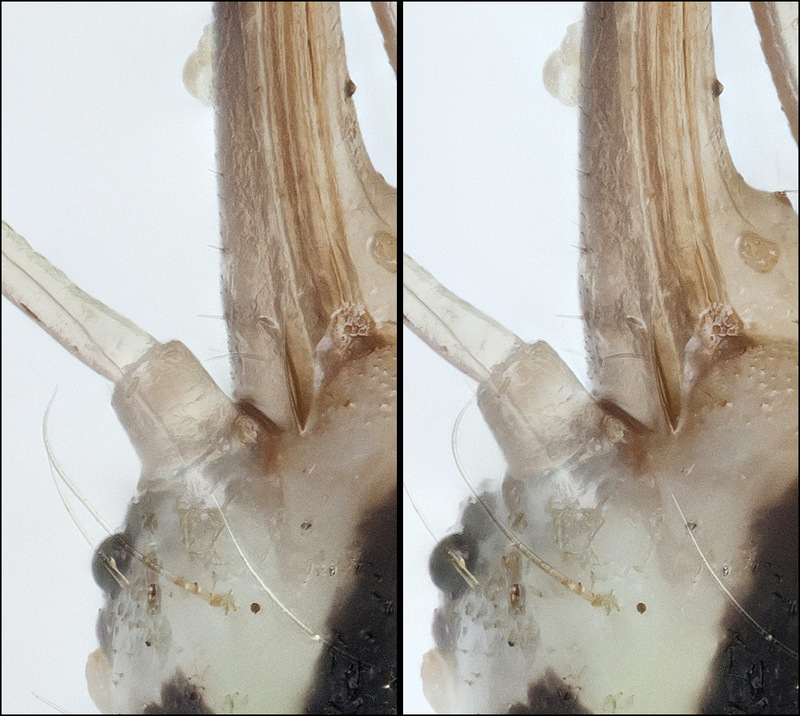 In larval Neuroptera, a groove on the inside of each mandible is converted to a tube by the juxtaposition of a slender lacinia (Fig 2.5A). Still curious, I wanted to get an even closer picture. So I repositioned the subject and mounted up a 10X objective. Here's the result of that. This is most of a full frame. The very blurry "ghost" running vertical next to the right mandible is actually the foreground antenna, which I made no attempt to include in the stack. In addition to what we can see of the mandible structure, I was interested to note the long tube running up through the middle of the antenna. I assume that's another tracheal tube, for providing oxygen to the tissues. 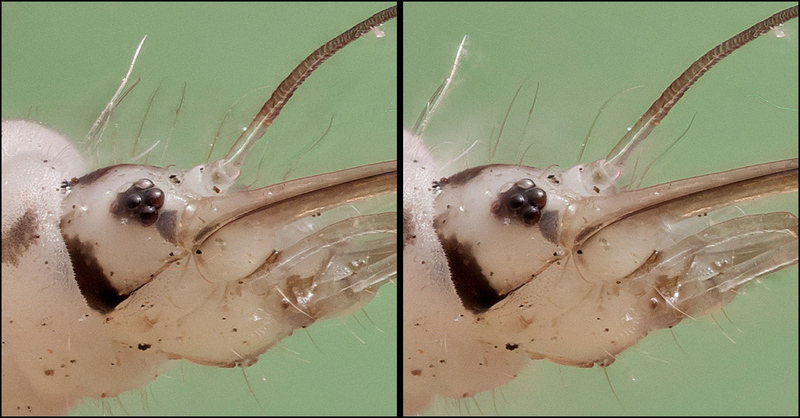 A camera-resolution version of the 10X stereo pair can be downloaded HERE. This is suitable for viewing in StereoPhoto Maker. The 5X stacks are using Mitutoyo M Plan Apo 5X NA 0.14 objective on Raynox DCR-150 tube lens, with rear bellows length shortened to reduce the magnification. About 140 frames with 0.020 mm focus step. The 10X stack is using Mitutoyo M Plan Apo 10X NA 0.28 objective on Raynox tube lens at rated magnification. 123 frames at 0.005 mm focus step. Continuous illumination by Jansjo LED. The first stack was with a single lamp, diffused by the fingertip from a latex glove. The second and third stacks were with two lamps, diffused through a double layer of Kleenex tissue. Canon T1i, ISO 100, 1/5 second for first stack, 1/1.3 second for second stack, 1/2 second for third stack, all with EFSC. Processed from RAW (CR2) format using Lightroom 5.6 with export to Zerene Stacker as quality 100 JPEG. The reason I exported as JPEG rather than TIFF was because I wanted to save the Lightroom export files as part of the project for retouching over several sessions. I had already optimized the exposure and other development parameters in Lightroom, so there wasn't much to be gained from TIFF and I wanted to avoid bloating the file sizes. Stereo shift +-3% for the lower mag stack, +-4% for the 10X stack. What a terrific macro subject! I love insects that get more interesting the closer you look. And an excellent subject for synthetic stereo too. When they're translucent like this sometimes the 2d can be misleading about what's internal and what's surface. I have never managed such sharp synthetic stereo with so few frames. To get this level of sharpness, I've been at 250-400 slices+! Maybe my lenses have more distortion/magnification shift at the edges? I'm not sure. But these are wonderful pictures. I especially like the 10x at full resolution. 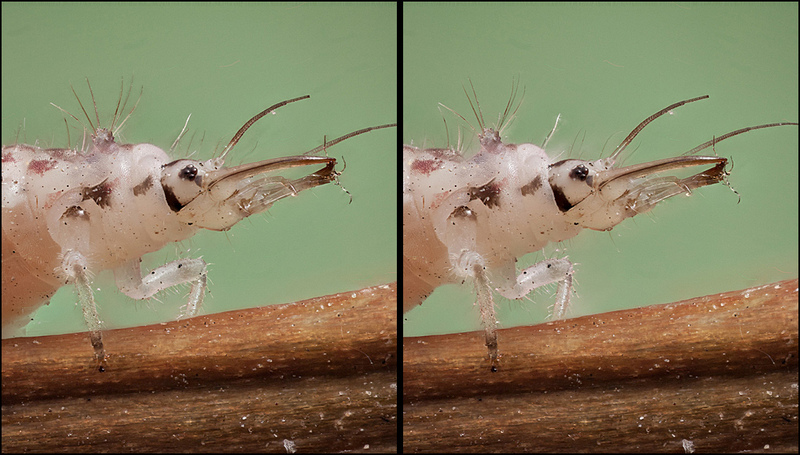 If you haven't read it, there's a great story about green lacewing larvae in the "Masters of Deception" chapter of T. Eisner's "For Love of Insects" (my favorite insect book so far). They mimic wooly alder aphid larva by covering themselves with bits of wax. That way they can avoid detection from the aphid shepherding ants that otherwise don't like anyone messing with their aphids. Thanks! One of the reasons I like stereo is that it's so definite and unambiguous, compared with trying to infer structure from highlights and shading. Your question about frame count is interesting. I generally figure that anything over 40-50 frames will make good stereo. The big issue is to shoot with a sufficiently wide aperture, so that details go in and out of focus before they move sideways very much in the stereo views. At high magnification like this, that happens automatically. At low magnification, especially when shooting with an adjustable iris, it's important to open wide instead of following the usual advice to stop down as far as possible while still getting the sharpness you need. The other thing I do is to sharpen aggressively in post-processing, after the stereo pairs have been made. For me, that makes the stereo lock up better and makes the fine detail "pop" so that I can see all that structure that was the whole point in the first place. It's interesting you mention increased sharpening. When I adjust a stereo image in Photoshop, I do it with my eyes crossed so I'm adjusting with the full 3d effect. I find that, compared to adjusting the same image in 2d, my taste leans to brighter, sharper, and generally more garish. For some reason, it just looks right to me that way. Maybe it's because in 3d, ones brain has more tolerance to accept whatever it sees as "real," whereas in 2d, you're creating an illusion of depth with light, shadow and contrasting boundaries, so in some ways there is less room for excessive alteration. When I adjust a stereo image in Photoshop, I do it with my eyes crossed so I'm adjusting with the full 3d effect. I find that, compared to adjusting the same image in 2d, my taste leans to brighter, sharper, and generally more garish. For some reason, it just looks right to me that way. Good points -- it is the same for me. It is interesting how few lenses are in its compound eye. I count six. Good observation. As I understand it, biologists don't consider this to be a compound eye. It's a collection of six "stemmata", each of which is a single-lens structure that may or may not have a multi-receptor imaging retina behind it, depending on what type of insect is involved. Stemmata are of two types, those with a single rhabdom, and those with many rhabdoms. The former occur in Mecoptera, most Neuroptera, Lepidoptera and Trichoptera. 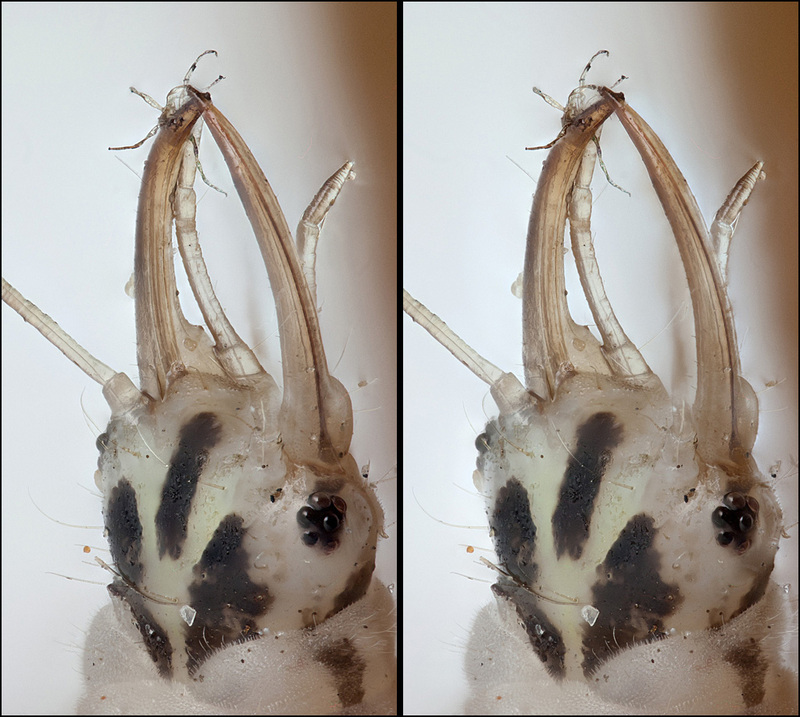 The larvae of the tiger beetle, Cincindela, have six stemmata, like caterpillars, but with a large number of retinula cells in each stemma, as in the Hymenoptera. The largest of the stemmata has about 5000 retinula cells each of which forms a rhabdomere on all sides so that the rhabdoms are in the form of a lattice. This larva is in the Neuroptera -- a completely different order -- so the quote about Cincindela is at most suggestive of the possibilities. But the larva is an active predator, so there's some reason to think that its vision might be pretty good. 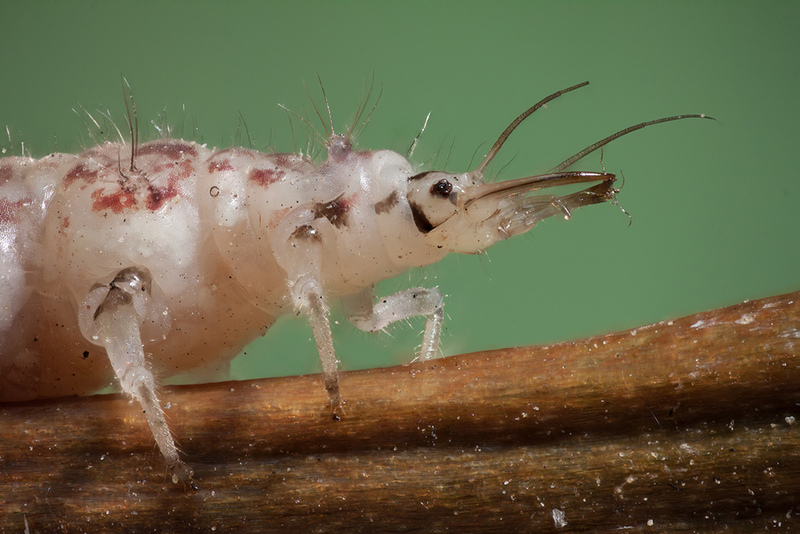 I haven't found any references that talk about lacewing larvae in particular. Maybe the thing just wanders around hunting by touch and chemistry. "Their senses are weakly developed, except that they are very sensitive to touch. Walking around in a haphazard fashion, the larvae sway their heads from one side to the other, and when they strike a potential prey object, the larva grasps it." Good find -- that looks pretty clear. impressive work Rik! And I really appreciate the technical details!